Plastic Spacers | Boker's, Inc.
Boker's is a stamping manufacturer of plastic spacers. Boker’s provides custom plastic spacers in a variety of shapes and sizes up to 5” x 7” (flat) with thicknesses from .005” to .125”. Plastic spacers are often used to achieve precise spacing between components and/or materials. To expedite your order and shorten delivery time, Boker's has immediate access to 2,000 commonly specified and hard-to-find materials including ABS, acetal, fish paper, FR-4, G-10, linen phenolic, MD Nylon, nylon, polypropylene, polyester, PTFE, PVC and many more. Certificates of Compliance or chemical/physical analyses are available upon request. To obtain a quote for spacers fill out Boker’s fast quote form and submit applicable production prints. 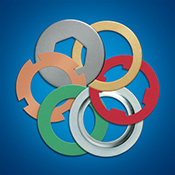 Search below to identify tools in stock available for manufacturing flat round spacers in any quantity without a tooling charge. You can choose an exact thickness for precision spacers within the tool range indicated. If no tool is available within your specified tolerance range Boker's can have a custom die manufactured in just a few hours. For custom orders fill out the fast quote form.